My husband was on the fence about the name Sawyer, but after we got the "sign" that it was good from the Baby Name Genie he was convinced! Thanks for your help! I'm surprised he didn't see Sawyer sooner. Glad he is off the fence now. Hope it didn't tear a hole in his pants. First name is Caroline. Can you make any suggestions for a middle name? Thanks! Do you want ANY suggestions or GOOD suggestions? We really like the name Brooke for our baby girl, but all we've found for a middle name is Lynne... we don't like it! Help genie! If its good enough for a city--why not your baby? You suggested the name Seth River and I fell in love with it. My son will be named Seth River now. Not only is it a very handsome name, but it has a personal meaning to me. Thanks! You are most welcome! As long as your last name isn't Banks, I stand by that first and middle name combination. Hello, I just wanted to thank you for the name. 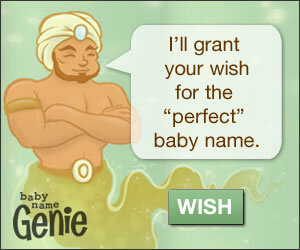 My due date is December 4th 2005 and I have been looking for names everywhere, and I found "the perfect name" thanks to you. My son's name will be Bradley James Harrelson. Indeed! Bradley is a fine name. I am glad you agree. I am sure your son will grow up to be an oustanding citizen. Keep practicing your breathing. You freaked me out! The first name you suggested, Alexandra, is on the top of our list. How did you know? My apologies on the freaking. A clarification--Alexandra was not a name suggestion, it is the fulfillment of your wish for the perfect baby name. That it was on the top of your list of names is either coincidence or evidence of your superior intelligence. You decide. Thank you for the perfect baby name! Could you please give me advice on how to help my wife "see the light" about the name? I wished--I dunno how many times--and not once did I see the name "Jim Bob". What gives?!? There is a good reason for that. I do like "Robert" and "James". "Bob" is short for "Robert" you know. I am worried that if I name my baby boy Lazarus as you suggested, he will be picked on in school. Your baby boy will be picked on in school.